Caitlin joined the firm as an associate in November 2017 after practicing law for several years in Northern Virginia. She focuses her practice on family law, personal injury, and civil litigation. Caitlin was selected as one of the “10 Best Family Law Attorneys in Virginia for Client Satisfaction” by the American Institute of Family Law Attorneys in 2016 and 2017. Moreover, she was recently selected by Super Lawyers Rising Stars for 2018 (Virginia and Washington DC). Caitlin zealously advocates for her clients to achieve the best possible outcome in each case. As a Fairfax County attorney, she provides her clients with knowledgeable and compassionate legal representation. Caitlin is an active member of the Northern Virginia legal community. She is a member of the Virginia Trial Lawyers Association, Virginia Women Attorneys Association, and Fairfax Bar Association. Caitlin was born in Massachusetts but raised in California. 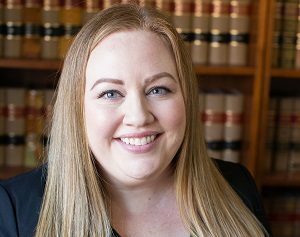 She attended the University of California, Santa Barbara before moving east for law school at Penn State University, where she was recognized as a Pro Bono Advocate through the Muller Public Interest Program. Caitlin now resides in Alexandria, Virginia, and we are thrilled to have her aboard. Associate Attorney, Livesay & Myers, P.C. Law Clerk, MacDowell Law Group, P.C.